Need to chat? Scroll down to contact us, cappuccino and good company always available. And do let us know where, or how, you heard about Indawo. CLICK HERE TO VIEW OUR TELEVISION ADVERT! Building Refurbishment Roofing Painting Waterproofing. For your building refurbishment, roofing, painting, waterproofing and remedial construction needs in Cape Town, Western Cape and in Johannesburg and Pretoria in Gauteng and Tshwane, Indawo is a leading, trusted and solutions-driven refurbishment and roofing contractor, offering solutions for all projects, from floor roof. We guarantee quality of workmanship, backed by all reputable product manufacturers’ guarantees, giving our clients total assurance. Indawo offers peace of mind by taking ownership to find the best solution to make our clients’ lives easier with care, passion and pride, while ensuring 100% compliance with all industry bodies’ guidelines and statutory laws governing the construction industry, giving total protection for our clients and staff. Indawo now offers white box and grey box construction solutions for commercial landlords. Commercial leasing generally offers a white box or grey box solutions, offering flexibility to commercial and retail tenants. Our Grey box solutions provide an unfinished interior with no additional facilities such as heating, air-conditioning, additional ventilation, lighting, plumbing, ceilings, interior walls. White box solutions from Indawo prepares the interior space for the tenant to complete the finishing touches. White box typically includes basic finishes such as standard ceilings and lighting, water and basic electricity, adequate access, standard flooring and access to bathrooms. White box and grey box solutions are available from Indawo in Cape Town, Western Cape and Johannesburg and Pretoria in Gauteng. So, for building refurbishment, roofing, painting, waterproofing and construction in Cape Town, Western Cape and Johannesburg or Pretoria in Gauteng, Indawo offers the right tailored solution for building owners, facilities managers, sectional title schemes and portfolio managers at managing agents. For any building refurbishment, roofing or construction projects in Cape Town, Western Cape or and Pretoria in Gauteng, be sure to contact Indawo at our head office in Cape Town or our Johannesburg, Gauteng office for all your enquiries. 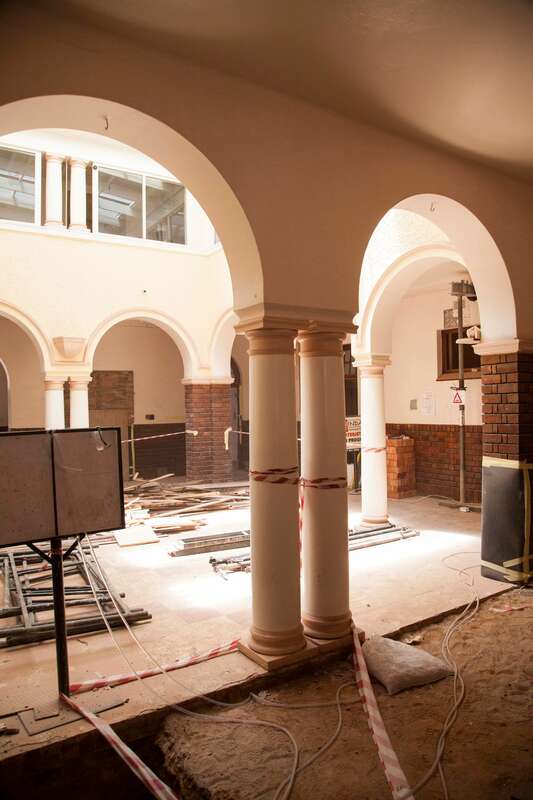 Importantly, when it comes to refurbishment, Indawo has a clear vision: to be the industry’s leading, trusted and solutions-driven building refurbishment and roofing contractor in South Africa. Your building maintenance challenges gets the right solution from 1 contractor: Indawo. Because of this commitment, Indawo is an approved contractor for Dulux, Plascon, Prominent Paints, Sabre Paints, Midas, Global Roofing Systems, a.b.e waterproofing systems and Sika. Indawo offers building refurbishment solutions from flooring to roofing, and everything in between, and has the expertise to refurbish commercial buildings, sectional title complexes and retail, industrial, commercial, office and historic buildings. From floor to roof, Indawo has a precise solution. For more on Indawo building refurbishment solutions, give us a call; it might just be the best phone call you make today. Click here to DOWNLOAD “the all you need to know” brochure. Imagine a place that fascinates you, a place that has it all. Well, imagine no more! Keep up to date with our roofing, building refurbishment, painting and waterproofing projects in Cape Town, Western Cape and Johannesburg and Pretortia in Gauteng. Catch up on Indawo news on social media. Follow us. Like us. Let’s chat. If you want to see some great work, you are in the right place. From building refurbishment in Western Cape and Gauteng to roofing, painting, waterproofing, asbestos removal and remedial construction, browse through our website, give us some feedback or just check out our incredible work, but do expect to be amazed. Indawo’s history spans more than 50 years and we are proud to show off key highlights. Go back into our history to see how awesome we are and why we are a preferred contractor to so many clients. See some of our roofing projects highlighted in the media, our building refurbishment successes online or our painting and waterproofing solutions that has had media coverage. Let's have a chat...contact us today. Need advice from floor to roof, and everything in between or if you need to speak to us? Use our quick contact on the right, or send us an email to info@indawo.biz and one of our super-efficient staff will be in touch in a flash. Do let us know where you heard about us.